Kraft Dinner came to Americans and Canadians during World War ll in 1937, marketed as a meal for four at .19 cents a box. Today, a box of macaroni and cheese can be purchased for between .50 cents and $2.00 depending on the brand. Here is a tip when cooking the old favorite. When I boil the noodles, I throw in some chopped carrots and broccoli to give it extra nutrition for my son. You could even mix in some chopped bacon to give it extra flavor. 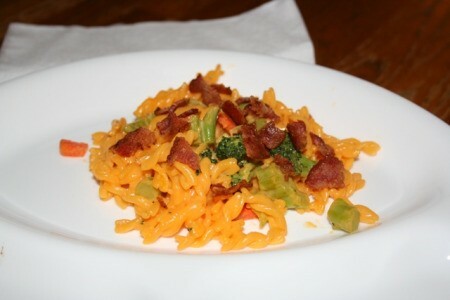 Kids who love mac and cheese will eat the veggies if they are chopped small. My boys love mac and cheese but I don't usually buy Kraft. I did some research on behavioral issues (my oldest has ADHD) and yellow dye #5 has been shown to have an effect. When I looked up what the dye is made of, I found out it is a coal tar derivative (yuck! ).